In the busy Bhadaur House market, huddled in a verandah, is a motley group of men who are trying their luck with a dice. The dice-thrower looks around furtively as he shakes the white cube in a little glass tumbler before throwing it in the middle. The little tumbler and the dice changes hands quickly and so does money. Even as animal rights activists and various conservation groups are spearheading a campaign against the shark fin soup — a delicacy savoured in foreign countries, specially China — some restaurants in the city are offering the soup to customers. Even though the monsoons have withdrawn and the hydel power reservoirs have not touched the optimum water level, yet the power supply position in Punjab is quite comfortable and the Punjab State Electricity Board (PSEB) has stopped buying power from the other states. The PSEB is looking for buyers of surplus power which it has at present. Clay and straw idols of different shapes and sizes of Goddess Durga were carried reverentially by devotees to the banks of the Sutlej today and finally immersed into the waters. This is what the tradition tells the Durga devotees that idols crafted with so much labour and worshipped for 10 days have to be submitted to the waters for that is its final destination. 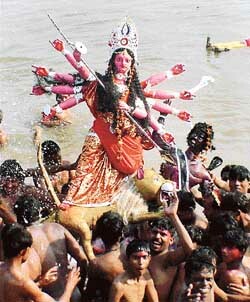 Artistes had made icons of Durga in clay and used poster colours so as not to pollute the river waters. The Sangrur police has asked the Ludhiana police to conduct a probe into the allegations levelled against CMC Hospital here by a Sangrur-based family. Taking note of a complaint lodged with the police by Sangrur-based Indu Bansal that her newly born baby died at CMC Hospital in July allegedly due to doctor’s negligence, Sangrur SSP A.S.Rai got her statement recorded. 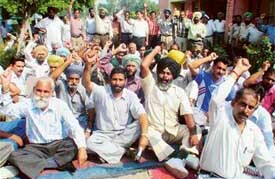 The Punjab state committee of the MCPI has alleged that the callous attitude of the district administration of Bathinda and the railway authorities resulted in the death of a farmer, Gurdev Singh, and injuries to others at the Bhai Bakhtaur railway crossing on September 30 during a statewide agitation. Fashions may come and fashions may go, but the sari, like a diamond, is forever. This six-yard wonder remains the epitome of feminine grace and elegance, with other popular women’s dresses hardly posing any challenge to this peerless garment. The Congress government, headed by Capt Amarinder Singh, is committed to the overall development of the state and a comprehensive plan has been formulated for infrastructure development in all major towns in the state. “Farmers of Punjab should try to store their paddy produce till December when the rates will surely rise. It will be a good bargain that even after paying the interest to the arthiyas, this will be a paying proposition”. Mr Shekar Sahota, general secretary, District Valmiki Sabha, has asked the state government to take appropriate action against those officers of the local Municipal Corporation who had allowed two organisations to take out their shobha yatras from the Daresi grounds on the same day as the eve of Lord Valmiki’s birth anniversary, which falls on October 10. Mr Parmjit Singh Saholi, President, All-India Youth Akali Dal (Ravi Inder group), has alleged that the unity between Akali leaders Gurcharan Singh Tohra and Parkash Singh Badal is for personal gains and not for the betterment of the Sikh Panth, as claimed by these leaders. The stone for a gate was laid by the council chief, Mr Joginder Pal Singla in memory of the sixth Guru Shri Hargobind Sahib on the G.T. Road crossing yesterday. A function was organised on the occasion which was chaired by Mr Jagmeet Singh Sahota, vice-president of the council. Mr J.P. Sharma, president, steel chamber, Mr Lachman Singh Saini, executive officer, Mr Chaman Lal Matharu, industrialist, Mr Harinder Singh Bhambri, Mr Rajinder Kumar Tittu, Mr Jagdev Singh (all councillors) and Mr Shahbaz Dhillon, Congress leader were also present. Members of the Government Pensioners Association have urged the Punjab Finance Minister, Mr Lal Singh, to release DA instalments, which is due from July, at the rate of 4 per cent. They have urged him to clear the DA arrears before Divali and pay DA in cash. The division No. 4 police yesterday arrested four persons and booked them under Section 160 of the IPC for quarrelling at a public place and disturbing peace in the area. Satish Kumar and Preet Kamal Singh, both residents of Chander Lok Colony on the Rahon road, were booked in one case while Shiv Kumar and Sanjeev Kumar,both residents of New Subhash Nagar on the Rahon Road were booked in another. The Central Excise has simplified the procedure of filing indirect monthly and quarterly tax return by manufacturers of excisable goods. The declaration has been reduced to a unified, single and easy one-page return. The Engineering Export Promotion Council has welcomed the decision of the Punjab Government to neutralise the freight up to a seaport for exports to the extent of 1 per cent of the FOB value, subject to the maximum of Rs 50 lakh per unit every year. Members of the Jammu Colony Small Scale Manufacturers Association ( JCSSMA) vowed to support the Chawla group in the elections of the United Cycle and Parts Manufacturers Association scheduled to be held on October 8. Harmandeep Singh Khurana, a PhD scholar in the Department of Soils, Punjab Agricultural University, has won the third prize in the Maulana Azad International Essay Competition-2002, conducted by the Indian Council for Cultural Relations, Ministry of External Affairs, New Delhi. Shivani Bector and Cheenu Garg, both students of MBA course at the Punjab College of Technical Education (PCTE), have secured the first and second positions, respectively, in the fourth semester examinations conducted by Punjab Technical University this year. 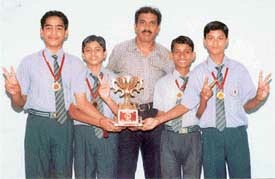 To bring about awareness regarding information technology and its applications among the students of government schools in the district ECIT computer centre has started a series of seminars from today. A six-week project training programme being conducted at the Guru Nanak Institute of Management and Technology (GNIMT), Model Town, concluded here today. The training programme imparted application skills on visual basic, oracle and MS access to students of BCA and MCA. The PVSC and CATC 2003 being held at Doraha is drawing to a close. A cadets’ night was celebrated yesterday. The Director of NCC, Punjab, Haryana, HP and Chandigarh, Group Capt Ajay Dudeja, was the chief guest. 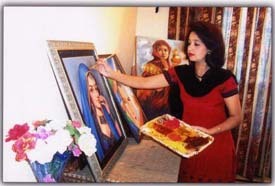 Her passion for art has brought her both name and fame. Seema Ghavri, a simple home-maker from Mandi Gobindgarh, is greatly influenced by rich Indian traditions. She is all set to showcase her creations of pots, murals, calligraphy, glass paintings and oil paintings at an exhibition at Lakshmi Ladies Club here on October 11 and 12.